How does the balance of the currents within each circuit affect the field from an overhead power lines? Each circuit is usually made up of three phases. Ideally, the sizes of the currents in each are exactly the same and the magnetic fields therefore largely cancel each other. But just as with the balance between the circuits, if the currents in the phases are not exactly equal, the cancellation is not as good, and the magnetic field is larger. Transmission lines operate with the phases very nearly balanced. Even if the loads connected to the phases are not equal, the way transformers are connected ensures the currents in the transmission system are evened up across the three phases. But the way the transmission system itself operates - in technical terms, the fact that the three phases do not have the same impedance - means there is still some small unbalance. Electrical engineers usually express the amount of unbalance as something called a "zero sequence current", and this is typically just a few percent of the load current (or "positive sequence current" in the same jargon - there is also another type of unbalance called the "negative sequence current" but this turns out to be less important for magnetic fields). Close to the line, such a small amount of zero-sequence current makes very little difference to the field. But whereas the field from the positive-sequence current (that is, the load current) for a single circuit falls as the reciprocal of distance squared, the field from the zero-sequence current falls more slowly, as the reciprocal of distance. So at large enough distances, it will always be the zero-sequence current - the unbalance of the currents - that determines the magnetic field. The picture gets even more complicated with two circuits. Each circuit will have a zero-sequence current. Depending on the phase relationship between these two zero-sequence currents, they may partially cancel each other, but there will still be a resultant out-of-balance current. That resultant would split between the earth wire and the ground itself, and all these different currents, small though they are, affect the magnetic field at large distances. At small distances, where of course the field is larger and therefore more likely to be of interest, the effects of the unbalanced currents are all negligible, and normally, perfectly acceptable accuracy is obtained by calculating the magnetic field just from the straightforward load current assuming all the currents are balanced. At large distances, where the field is normally too small to be of interest, it is necessary also to consider the unbalanced currents. This can be seen from a particular example. This graph shows the results of an exercise to compare calculated and measured fields. The three curves show the magnetic field calculated by taking account of progressively more of the currents. Curve A just takes the load current in each circuit - so it takes account of any unbalance between the circuits, but assumes each circuit is balanced within itself. Curve B takes account of positive, negative and zero sequence currents - that is, it takes account of the unbalance within each circuit as well as between circuits, but considers only the currents within the actual phase conductors. Curve C takes account of everything - currents in the earth-wire and ground as well as unbalance within and between the circuits. The points show measured fields. 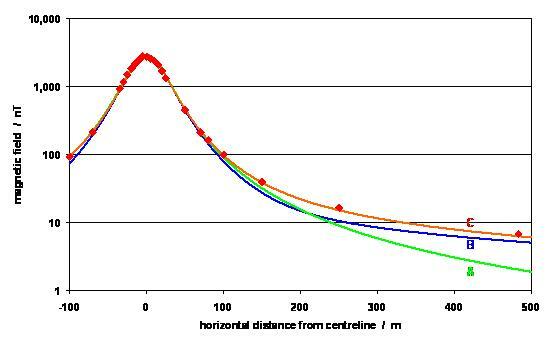 It is only curve C - taking account of all the different unbalanced currents - that calculates the field accurately over the whole range of distances. But within, say, 100 m, roughly where the field is greater than 100 nT or 0.1 µT, all of the curves give a pretty good fit. The effect of all these factors can be expressed as the power of distance which the field falls as - is it inverse distance cubed, or distance squared, or just distance? .